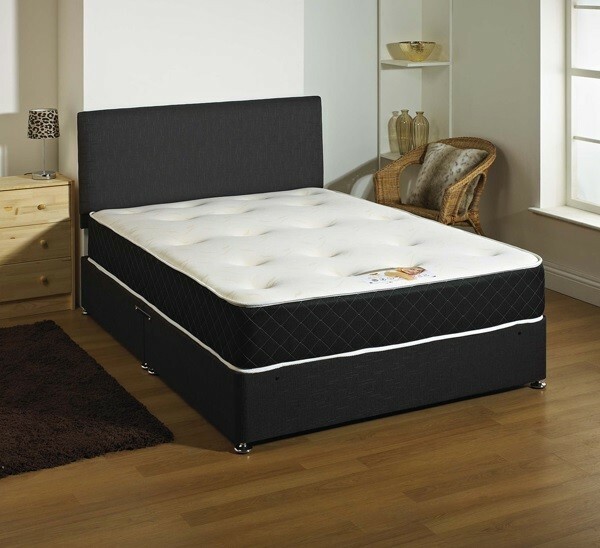 The Kensington 2000 Pocket Spring & Memory foam 4ft Small Double Divan Bed comes with a luxury mattress with white damask material at bottom side of the mattress, and a hand tufted hessian Black / Charcoal border. The Mattress is constructed around 2000 count pocket spring units with ultra-supportive layers of high density visco elastic Memory foam to distribute pressure and to provide ultimate comfort and support. Each Spring is sewn into an individual fabric pocket allowing it to move independently and respond to the body's every movement and contour. It provides the best possible support to your spine allowing your body to immediately find the best sleeping position, reducing tossing and turning. The extraordinary features of this Mattress helps blood to flow and circulate freely, preventing the nerves and muscles from numbing. This allows for an even distribution of weight and gives a fantastic support for the body and a relaxing sleep. The Divan Base mostly comes in two horizontal split halves, but when you purchase it with side slide storage, the divan base comes in two vertical split halves.